BRUSSELS, Belgium -- Russia’s annexation of Crimea and its threats to eastern and southern Ukraine amount to an “alarming use of both military force and subversion” the chairman of the Joint Chiefs of Staff said here today. U.S. Army Gen. Martin E. Dempsey (R), chairman of the Joint Chiefs of Staff, at the NATO Chiefs of Defense meetings in Brussels, May 21, 2014. 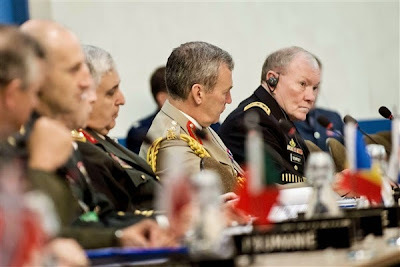 Army Gen. Martin E. Dempsey discussed the Ukraine situation with his counterparts at the NATO defense chiefs’ conference. The defense leaders used the phrase “proximate coercion and subversion” to describe Russia’s actions in Ukraine over the past few months. Regarding Ukraine, the Russians have employed the threat of conventional force -- but only the threat, Dempsey said in an interview following NATO meetings. Instead of using conventional military power, he said, the Russians have employed surrogates, proxies, misinformation and economic levers to accomplish their goals in Ukraine. “I don’t know if that is a new type of warfare,” Dempsey said. Defending or deterring this threat requires different capabilities, Dempsey said. “The military instrument of power generally deals strength-on-strength,” the chairman said. If an Eastern European nation wanted to harden itself against such a threat it would require different instruments of deterrence, he said. There is a military piece, but there is also a law enforcement portion, an informational aspect and “some governance activities in order for these populations to feel safe within their own borders so they are not subject to being coerced,” Dempsey said. “It’s a whole-of-government approach,” he said. NATO nations obviously have experience with this, the chairman said. He pointed to NATO forces deployed in Afghanistan where they have used the whole-of-government approach in establishing and running provincial reconstruction teams around the country. Such an approach employed “the different agencies of different governments all coalescing on a campaign plan, contributing their unique abilities and authorities and producing a positive outcome,” he said. “He told a very persuasive narrative about the fact that they had built their military to be kind of expeditionary, out of area,” Dempsey said. “He said, if they are invaded, they will defend Ukraine,” Dempsey said.